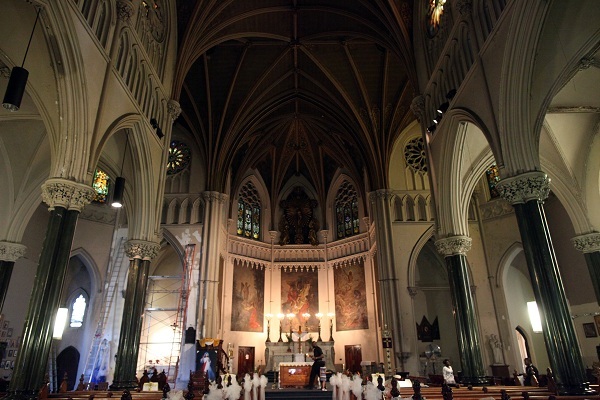 All Saints Church, designed by James Renwick, is one of the subjects of Cardinal Dolan’s decrees. Each decree follows the same form. Generic whereas clauses – which do not relate to the specific facts of the parish in question – assert a rationale for the decision. We note that prominently featured as the second such clause is Cardinal Dolan’s favorite “The Church is not an archeological museum;” this is intended to delegitimize from the beginning any objections based on the “artistic” value of a church or its historic importance to a community or neighborhood. Such language does helpfully confirm, however, that the Roman Catholic Church of today views artistic beauty and historical importance ( evidenced by landmarking) as antithetical to its principles. It also would seem to acknowledge that some of the churches to be sold under these decrees have such significance. I am not sure at all, however, that the reference provided by Cardinal Dolan – which seems to deal with the significance of the Byzantine liturgy – in fact has the meaning he cites it for. Next, the pastor (in one case it is the chancellor) of the combined group of parishes which includes the church to be sold, citing the “immense financial burden” to repair and maintain it, writes the Archdiocese a letter requesting its “relegation to profane use.” Which request is of course granted. These are the churches in Manhattan. In each case we link to our article, if available, on the subject. As usual in such actions, there are arbitrary surprises. The church of the Most Holy Crucifix (presumably the building most recently known as the “chapel of San Lorenzo Ruiz” and where this Society sponsored the celebration of a mass as recently as December 2015) in now to be sold. St. Gregory the Great, after surviving “Making all Things New,” suddenly was closed; St Benedict the Moor had been closed entirely apart from the MATN process. Our Lady of Peace previously has been handed over to the Copts. Conspicuously absent from the list, however, is the historically most significant church Cardinal Dolan has closed, St Stephen’s. 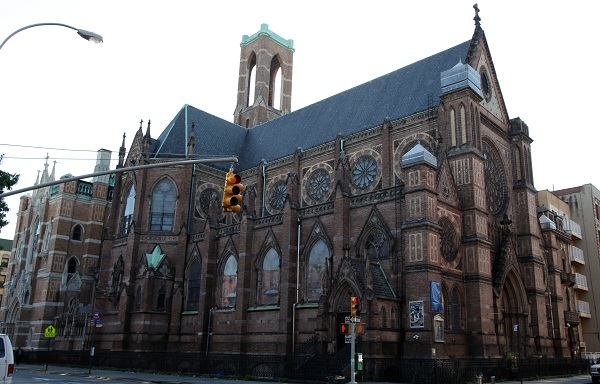 Although is no one concerned about the loss of Renwick’s All Saints, or of St Benedict, once the first Black church of New York, or of St Elizabeth of Hungary in the midst of its quaint streetscape? There are 545,000 registered Catholics (in the Hartford Archdiocese), but only 122,000 attend Mass on Sunday. The missing 423,000 include members of my extended family and almost everyone with whom I grew up. Their absence saddens me more than do the closed buildings. And I can’t help wondering how things would have worked out if those parishes had chosen a different path. Imagine if those parishes in the Archdiocese of Hartford had spent the last 40 years fostering the Catholic orthodoxy of Pope St. John Paul II and the liturgical solemnity of Pope Benedict XVI. In a way, yes. The author’s trying to get at the true root causes. But Mr Wolfgang seems to think these “restructurings” are are a matter of individual progressive (“dissenting”)churches imploding and being closed. Regrettably that is not the case. For the problems of the Hartford Archdiocese were fostered from the top and spread Archdiocesan-wide under liberal hero John Francis Whelan (Archbishop of Hartford 1968-91). And his bureaucratic successors did little or nothing to alleviate the problems. 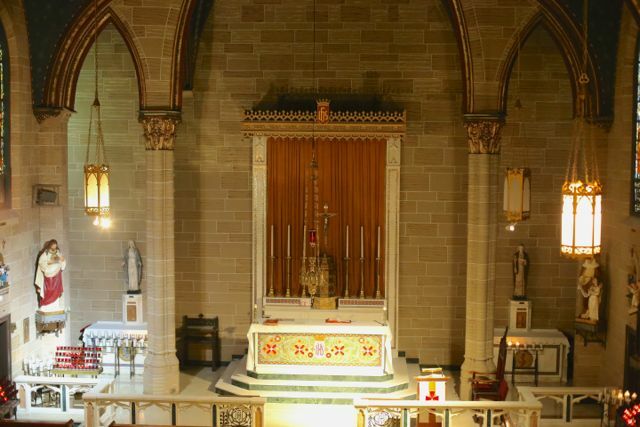 The restructuring axe falls, moreover, not primarily on collapsed progressive parishes but on all churches – poor, wealthy, half-empty or full – very often on parishes which have sponsored the Traditional Mass. Mr Wolfgang does bestow a complement to the parish of St Mary’s Norwalk – which features the Traditional mass! Too bad it’s in the Bridgeport Diocese! In my English Diocese the same is happening: a decimation of parishes. The Bishop’s disingenuous explanation, who would call it lying, people movement. When it arises from the lack of teaching of Catholicism from the pulpit, in the schools, the equivalence preached between Catholicism and Protestantism, not to mention respect for Islam. How dreary! I grew up in the archdiocese of Hartford and it always seemed like a ghost town of churches where Catholics once lived. Cronin, Mansell, and now Blair seem to be little more than caretakers (and passed up cardinals) for a dying institution with little concern for the people there.